Cruise through the Inland Waterways of the Carolina’s out to the Atlantic Ocean and watch the Shrimp Boat Fleet work their Nets. Watch as the Dolphins, Sharks and other Marine Life feed behind the Shrimp Boats. Weather permitting, our crew will haul aboard a basket of Marine Life that includes Shrimp, Crabs, Fish, Sea Urchins, Sea Horses, Sand Dollars, Sea Shells and Baby Sharks. A 2 1/2 Hour exciting Dolphin Cruise that Families and Kids will Love! 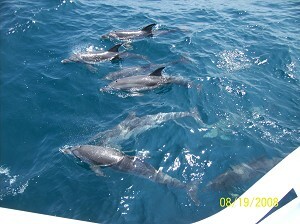 Voyager Deep Sea Fishing & Dolphin Cruises offers dolphin cruises myrtle beach and north myrtle beach. Be sure and make your reservations early as these tours fill up fast.